Everyone is familiar with the concept of training their own employees with an LMS. The benefits are clear. Get your people up and running faster, increase their knowledge and boost their performance. But what about customer training? Why provide training for your customers? How can you even do this? And why has this become such a prominent trend? In this post, we answer all of your customer training questions. What is a customer training program? Customer training is a branch of eLearning called the extended enterprise. This refers to the training of people external to your business. This includes partners, resellers, and customers. In this post, we’re going to focus solely on customers. Customer training programs are courses created to help users, use your product. Customer training has quickly become popular especially with software companies. The reason for its recent surge in popularity is that it helps to raise the customer experience. Customer training programs increase the value proposition of your business. If you have a great product or service, you want your customers to reach the point of value as soon as possible. We like to call it the “Aha” moment. It’s when the user understands exactly how the product will save them time, or make their life easier. Training helps to bring about this moment. By training a customer, they engage more with your product, with less frustration, and are more likely to become long-term users. Rather than just getting them past their current stumbling block, you are helping them become more knowledgeable. In turn, your product becomes more and more valuable to them. What are the benefits of customer training for you? We’ve already mentioned many benefits that arise from training your customers. But the truth is, there’s a very long list. Here are the more common ones. Training at key times can drastically improve the success of your customers. One of the most crucial times is during customer onboarding. Great training allows your product to shine. Its value should ‘click’ with the new user, encouraging their continued use. Competition for customers is intense. Customer training programs have become more prominent because they serve as a differentiator. Great training raises the customer experience. This training creates value beyond simple troubleshooting. Companies are recognizing that training creates more engaged, capable users who derive greater value from their product. This has a direct impact on customer satisfaction metrics like CSAT, or NPS. Customer training helps to retain more customers by addressing the points of friction in their experience. If customers are falling away because of a steep learning curve than an onboarding course may help to bring a greater percentage through the process. Check out our post on 4 steps you can take to retain more customers with customer training. Training helps to alleviate the burden of support tickets. Not only does training prevent common queries from being raised, it also arms your support team with an exceptional resource so they can go beyond simple troubleshooting. They can provide a solution to the current problem by assigning training to users of your product that need a hand getting to grips with certain features. Customers that are more experienced at using your software are more likely to upgrade to higher plans. We see that ourselves in LearnUpon. The tools we use the most are the ones we use best and want to upgrade. Training plays a big part in getting your customers to that point of success. When someone’s score is in the ‘promoter’ bracket they’re so happy with your product that they will market it for you. They are vocal and motivated. And they’ll help your product find new users through referrals and recommendations. The best way to explain customer training is with an example. This scenario will hopefully help to clearly depict great customer training: A software company has an excellent product on the market. However, after some research, they’ve identified a number of areas where their customers are struggling. They decide to provide training to their customers in an effort to improve the user experience and to reduce the number of support queries they receive in relation to these tricky areas. They create a series of eLearning courses that their customer can take whenever they like. These courses are an important part of customer onboarding and continuous customer education. Courses are launched directly from within their own software via Single Sign-on (SSO). This is convenient for the learner and it helps with the adoption of your product. Due to the success of their customer training so far the software company has started creating courses for new features and new workflows that they release. But why use an LMS to train your customers? An enterprise LMS is the best way to provide customer training simply because it’s built for that specific purpose. In the past, a guide, or maybe an FAQ document would commonly fulfill that same purpose. With a Learning Management System (LMS) you can do much more. And at a larger scale. An LMS makes training all of your customers in one place possible. Your customers exist across the world, in different time zones. They want access to training, on their own terms. That’s why the online/LMS customer training model works. It allows them to access training when they need it. And why not just put up videos on YouTube? That’s an option, but most companies want to provide training only to paying customers. The LMS enables you to only grant access to them. If you are going to dedicate time and budget to creating and maintaining a customer training program, you’ll want a speedy return on investment. You need to focus on the most tangible evidence of the ROI of customer training, especially if this is a new venture. There are some hard metrics to examine. By combing CRM and LMS data you can look for an increase in your customer retention rate, an increase in the number of upgraded accounts and a decrease in the cost of support (fewer tickets/queries per month). When customer training sits alongside a customer-centric approach it works best. It’s another way to engage and delight customers. Some companies even positively impact this ROI figure by using an eCommerce model. Providing customers with the ability to purchase and take courses in a self-service model is a great way to transition your expertise into another source of revenue. 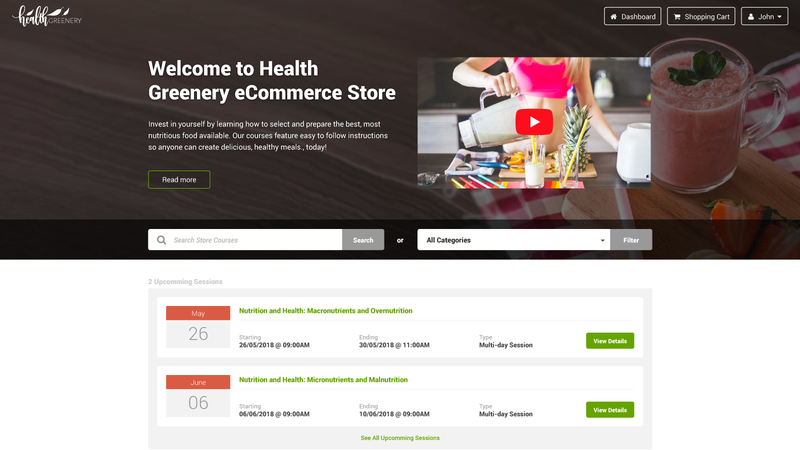 Setting up an eCommerce storefront in LearnUpon is as easy as setting up a social media account. 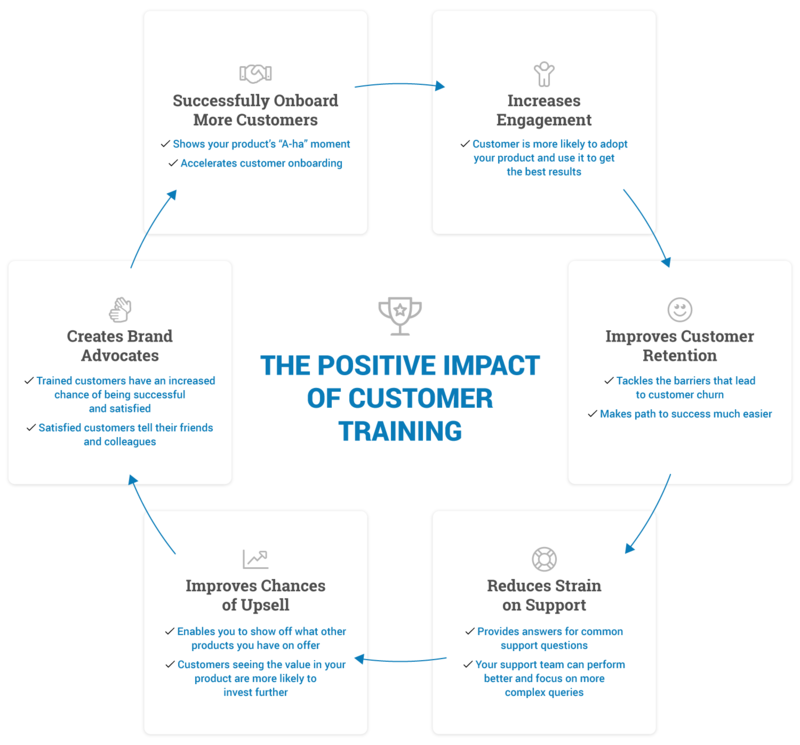 Creating a successful customer training program is easier than you think. As you keep things simple and develop your training efforts over time. Set up a customer portal in an LMS like LearnUpon. Customize the look and feel to match your brand. And then fill it with training materials. Creating a beginner's guide to your product is as simple as adding and arranging documents, videos, and quizzes! Delivering customer training with an LMS is easy. Customer training is an excellent way to add value for your customers, get them up to speed with your product or service quickly and ultimately build a stronger relationship with them. Train your customers with LearnUpon. 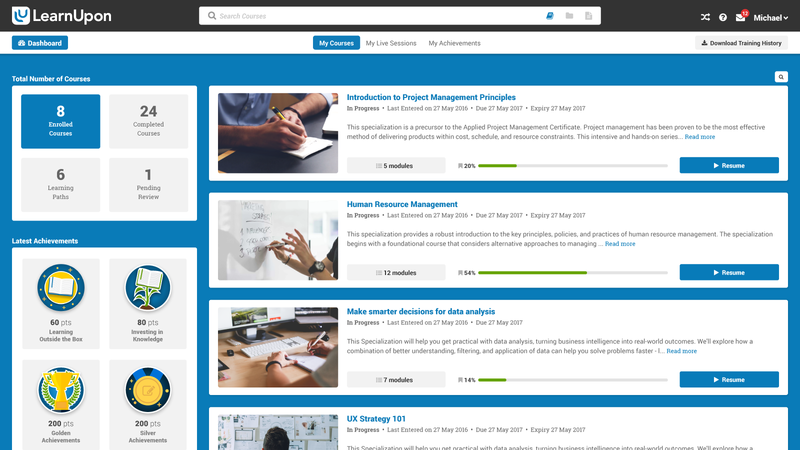 The powerful learning management system that has the features and a knowledgeable team you need to achieve training success. Get your free trial and demo today!